I absolutely love woodland animals. Mice, Racoons, Bears, Deer, Squirrels, Foxes, Hedgies, Birds...all of them!! 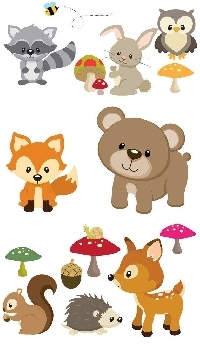 For this swap you will have ONE partner and you will send FIVE woodland animal items to them. Items can be anything as long as it has woodland animals on it... Sticker Sheet Washi/or sampler Sticky Notes (at least 12) Note Books/journals Pens Pencil Pouch Key Chain Stuffed animal Get Creative!! Please only send items you would like to receive yourself. You know how this all works. Don’t send 5 stickers and call it good. Find things that make you go “awww” and send them!! I am not putting a rating min. But I will be checking profiles. If you have any recent problems I will not allow you to do this swap. I made this USA only, if you would like to do an international one, please go ahead.